A new e-book, free for download, collects Construction Canada stories related to acoustics and sound masking for spaces such as this one. Photo © Zahid Ghafoor. Photo courtesy K.R. Moeller Associates Ltd.
Construction Canada proudly continues its series of e-books with a new collection offering in-depth technical exploration and practical lessons learned related to sound masking. 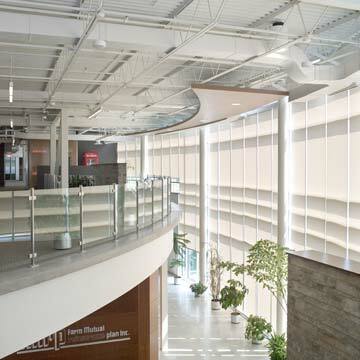 selecting the right ceiling for an office, complementing other noise-control methods. Download the Strategies for Sound Masking e-book at http://www.constructioncanada.net/strategies-for-sound-masking-ebook.